On Israel's Mediterranean shoreline, the Island Luxurious Suites Hotel in Netanya offers a pampering vacation experience that is truly unique among Netanya hotels. Situated on a cliff rising above the sea, all of Island's suites enjoy full panoramic views over the Mediterranean.The hotel's location, only 30 KM north of Tel Aviv and right in the center of Israel, make the Island an ideal base for visitors eager to explore Israel's many touristic sites in comfort and style. 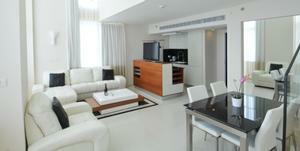 As the newest and most prestigious hotel in Netanya, Island Suites is setting new quality standards for Netanya hotels. The beachfront location is ideal in every sense for a Netanya hotel, giving guests the opportunity to enjoy spectacular views while still being close to the many attractions of the city. And, of course, the expansive, luxurious suites of this exceptional Netanya hotel, featuring especially large balconies and a contemporary design, are the jewel in the crown of Netanya hotels. Island Suites is the Netanya hotel you've been waiting for. Your hotel. Your home. Cancellation: In regular season up to 2 business days prior to arrival date with no cancellation fees. Cancellation Less than 2 business days One-night cancellation fee. A charge less than 7 business days prior to arrival will be charged at full cost of each stay.